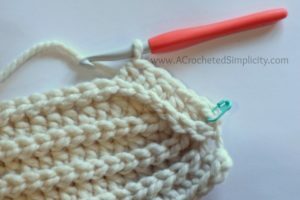 Do you find yourself watching television and noticing everything that’s knit or crochet? Lately, many have been taking note of the different hats being worn by the Olympians. Some are simple, some complex, but most are likely machine knit. So when you don’t want to spend $100, or wait for one to arrive from an online store, what do you do? 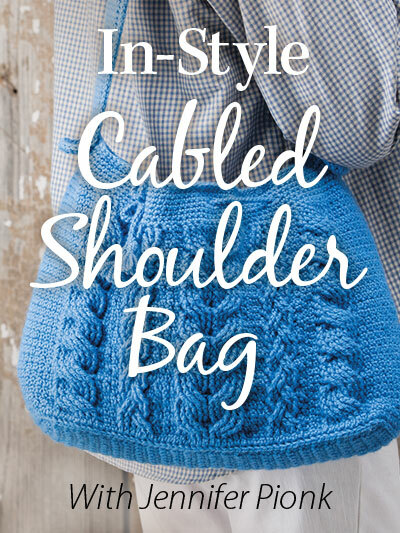 You set out to make your own handmade knit-look creation. 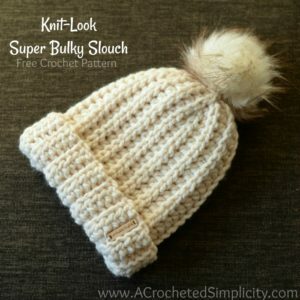 Tammy posted in my Facebook Community Group asking if anyone knew of a crochet version of the slouch worn by Olympian Chloe Kim. 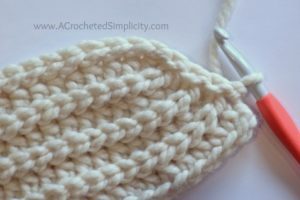 Since I needed a break from a large project I had been working on, I grabbed a large hook, some super bulky yarn, and set out to create a knit-look crochet version for her (and all of you). 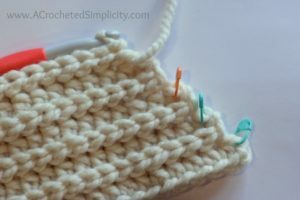 See gauge swatch instructions below. 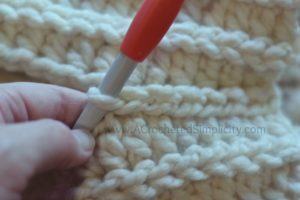 Turning chains are not counted as a stitch or included in stitch count. This hat is worked sideways using my favorite short row method and then it is seamed. If you prefer a longer or shorter hat, simply increase or decrease your foundation chain. 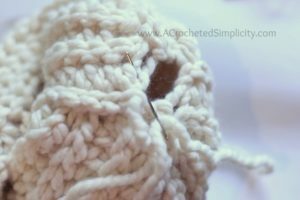 If you need to adjust the circumference of your hat to make it larger, simply begin another short row section and work additional rows, ending w/ an odd numbered row, then seam. If you need to adjust the circumference of your hat to make it smaller, simply work fewer rows, making sure to end with an odd numbered row before the seam. Row 2: Ch 1, BLO sl st in each st across. Turn. Row 3: Ch 1, BLO hdc in each st across. Turn. Rows 4 – 8: Rep Rows 2 – 3, ending w/ a Row 2 rep. Finished Size (laid flat): 8-1/2″ W x 12-1/2″ L (band not folded up); 8-1/2″ W x 10″ L (band folded up) *Note: Finished length is shorter than Row 1 due to the nature of the short rows. 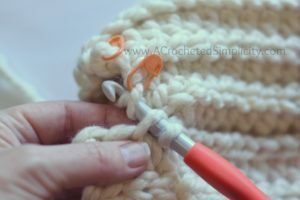 Tip: Place a SM in the FLO of the first hdc of Row 1 & every odd numbered row throughout. 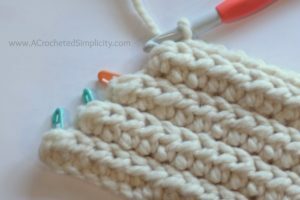 If you haven’t worked short rows before, this will help you complete Row 8 & the end of each short row section after Row 8. Row 8: Ch 1, BLO sl st in each st across previous row, BLO sl st in each unworked st to Row 1. Turn. (28 sts) Remove SM after completing this row. 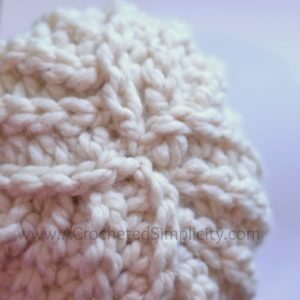 Shows the Right Side of the hat before completing Row 8. Shows the Wrong Side of the hat, Row 8, just before working into each of the unworked stitches along the short rows. Shows Row 8, working into the unworked stitches along the short rows. Shows Row 8 complete. First short row section complete. Shows the Right Side of the hat. Ready to begin Row 9. Shows the beginning of Row 9 being worked. Rows 10 – 15: Rep Rows 2 – 7. Rows 18 – 23: Rep Rows 2 – 7. Rows 26 – 31: Rep Rows 2 – 7. Seam – Row 32: See photos below. With the Right Side of the hat facing you bring the first row up to meet the last row. 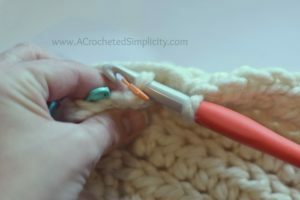 Position your working yarn so that it’s on the inside of the hat. Slip stitch the rows together using the following method: insert your hook (from front to back) into the FLO of the 1st stitch of Row 1 (first pic below), insert your hook (from back to front) into the BLO of the 1st stitch of the last row (second pic below), yo, pull thru all loops on your hook (third pic below). 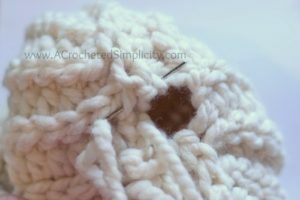 Continue in this way across the hat to complete the seam. 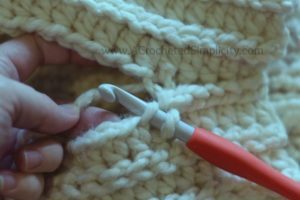 When you get to the unworked stitches of the short rows, continue seaming in the BLO just as you would do to finish up a section of short rows (fourth pic below). You can also see a video tutorial of this seam being working HERE. Fasten off leaving an 8″ tail of yarn. Continue on to finishing. Using a yarn needle and the 8” yarn tail, weave in and out of ends of crown opening. 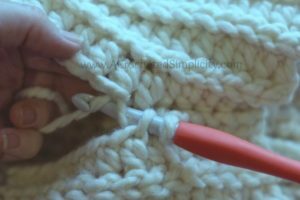 Pull yarn tight to close gap. Weave in ends. Add a pom, if desired. 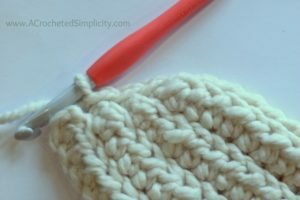 Fold the edge of the hat up 2-1/2″ and wear! 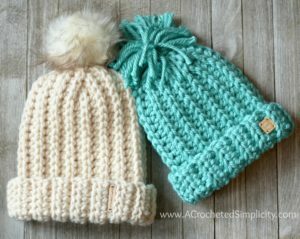 I’d LOVE to see your finished hats! 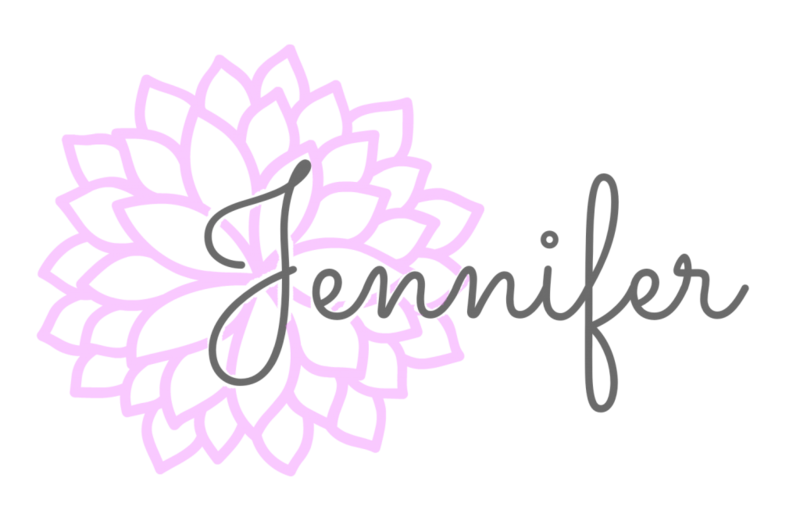 Stop on by the A Crocheted Simplicity Crochet Community on Facebook to share! ? I love the look of this hat! BUT, I can not get my wrong side to look like yours. I’m obviously doing something wrong. 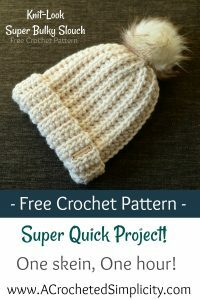 Do you have a video tutorial showing how to make the stitches used in this hat? Thanks! Hi Connie ~ I finally fought my internet and won and the video tutorial is now available! Do you have. the istructions in left hand. Tank you..